The annual men’s health campaign, Movember, that asks men to grow moustaches for a month is looking forward to seeing faith groups join them in their follicle fun. For 30 days from the beginning of this month, hairy upper lips will be raising awareness and money for men’s health causes and with the introduction of the ‘Holy Mo Challenge’, churches across the UK have a new way to get involved. Movember’s Network Challenges bring together groups and communities from within the same industry in a fun, competitive environment. The launch of the ‘Holy Mo Challenge’ is set to let faith communities show off their renowned capacity for facial growth, gathering together leaders, local churches and communities to help achieve their vision of having an everlasting impact on the face of men’s health. 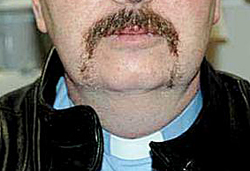 The Rt Rev James Newcome, Bishop of Carlisle and lead Bishop on healthcare for the Church of England adds, “I would like to commend Movember for encouraging faith communities to engage with issues of men's health and encourage people to consider growing a moustache this Movember, proudly sporting Holy Mos in our communities and supporting those who do. Churches from Glengormley in Northern Ireland and Clyde Valley in Scotland, to Stockton, Doncaster and Shoeburyness in England have already entered the Challenge. The campaign has raised more than £275 million since it started in 2004, with more than a million people taking part in 2012. Men and women, known as ‘Mo Sistas’, can join Movember at https://www.movember.com/uk/register, enter teams in the Challenge at http://monetwork.co/holymo, order a promo pack from http://uk.movember.com/merchandise/view/id/773 and view a free, embeddable slideshow to accompany the launch of the Challenge.